Big Pot Potter Scott Semple currently operates out of his studio in Los Osos, CA. 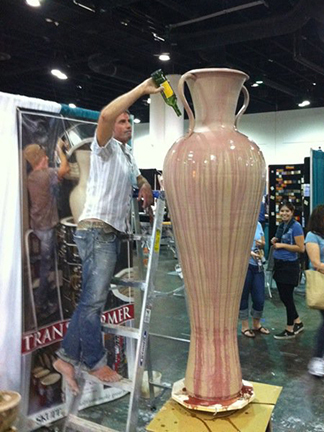 Scott has been fascinated by the format almost from day one of his pottery experience. Cutting his teeth firing wood fired kilns in Northern Arizona, Scott was exposed to the large works of artists such as Don Reitz. Scott throws his pots in sections and then joins them together by creating tongue and groove rims that fit seamlessly together. Scott fires his large pots in electric kilns. This allows him to more accurately control the temperature and prevent cracking. 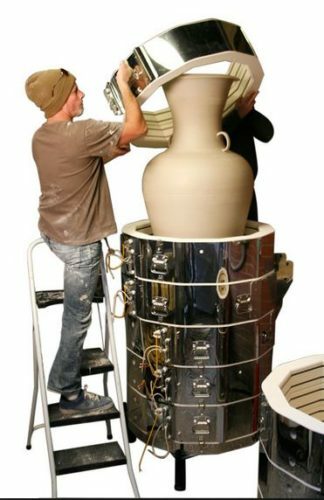 Check out this video of how he stacks the kiln over the pot using a Transformer kiln at one of his workshops.